The second Asia-Pacific edition of the Sustainable Foods Summit will be hosted in Singapore on 4-5th September. Focal themes of this new edition are sustainable packaging, food ingredients, and marketing. 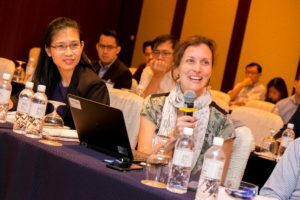 For the first time in Asia, an executive summit will look to advance sustainability in the food industry by the use of ingredients and packaging. The summit opens with a discussion of some of the pressing sustainability issues facing the Asian food industry. Urban migration has given the continent 9 of the 10 most populated cities in the world. Food security is a growing concern, with many sections of the population having limited access to nutritious food. The role of sustainable agriculture in addressing food security & poverty will be discussed. Dato’ Joel Low, CEO of Agrivo International, will explore the solutions provided by urban farming. A number of Asian countries are looking at vertical farming and urban food projects to feed their sprawling metropoles. Joel Low will state the environmental and social merits of such projects. Mitchell Leow from Asia Pacific Breweries (APB) will show how one of the largest breweries in Asia is addressing its water impacts. Its ‘Brewing A Better World’ initiative aims to reduce water consumption by a quarter, carbon emissions by 40 percent, and source raw materials from sustainable sources. The Swiss multinational Nestle will also give details on how it is implementing sustainable sourcing projects for coffee. Massimo Reverberi, Founder of Bugsolutely, will kick off the food ingredients session with a seminar on novel proteins. His company is developing insect-based food products for the Asian market. Made from silkworm, Bella Pupa chip style snacks have been launched in the Chinese market. The company also markets Bugsolutely pasta made from cricket flour. The benefits provided by blockchain technology to ingredient supply chains will be explored. Other speakers will cover food ingredients from natural flavourings, biodiversity impacts, and innovating with sustainable ingredients. Shi Yan, widely regarded as the founder of Community Supported Agriculture (CSA) in Asia, will introduce the concept and its benefits. She has set up Little Donkey Farm and Shared Harvest Farm in China; the latter is one of the first Chinese organic farms to adopt the CSA model. Almost 1,000 farms in China now belong to the CSA Alliance, providing freshly grown local produce directly to consumers. David Yeung, Founder of Green Monday and Green Common, will show how Asian food companies can capitalise on the vegan trend. An environmental advocate, David is the founder of the Green Monday movement which has spread to 30 countries, with 3 million adherents in Hong Kong alone. David will highlight the opportunities for plant-based foods, sharing experiences from the Green Common retail network. Sodexo, the international foodservice company, will give its perspectives on sustainable foods in the Asian region. Packaging waste has become a major concern in Asia, with recent news of a whale suffocating off the shore of Southern Thailand after swallowing 80 plastic bags. The sustainable packaging session discusses practical approaches to reduce the packaging impact of food and beverages. The ecological issues associated with product packaging will be discussed, whilst other speakers will cover eco-design approach and sustainable materials. David Christian, Co-Founder of Evoware, will present the company’s sustainable alternative to plastic packaging. The Indonesian firm has developed seaweed-based packaging that is edible and biodegradable. Details will be given of applications of the new packaging material for food and beverage products. Indonesia is the world’s second largest contributor to plastic pollution. Since the country is also the world’s leading seaweed producer, Evoware aims to create positive social impacts (by creating employment for seaweed farmers) whilst reducing plastic pollution.